This is Max. His picture was taken a few days before Halloween during his first visit with us. He was newly adopted. His Mom put a cute Halloween hat on him and he wore his costume with excitement and pride. He seemed happy, well adjusted, and game for just about anything. Fast forward a few days to Halloween night. Max’s mother felt that he was well adjusted enough to Trick-or-Treat with his family and so they set off into the fray of Trick-or-Treating on Main Street in Sandwich on Halloween night. Ten minutes into it, Max was a nervous, shaking mess. There were too many people, too many noises, and the costumes really freaked him out! His Mom had to carry him back to the car where he hid under a blanket for the rest of the evening (it was a cool night, and the temperature was safe inside the car for Max). 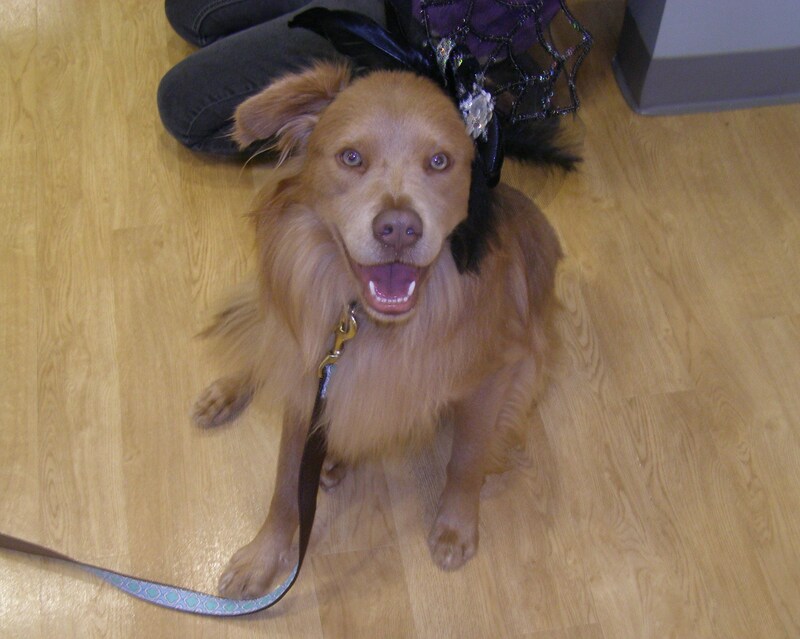 In honor of Max and his family, Oceanside Animal Hospital has compiled a list of Halloween Do’s and Dont’s to keep your pets safe during the holiday. 1. Keep your animals – particularly cats – indoors on Halloween. It’s unfortunate, but animals can be the target of abuse and pranks on Halloween night. 2. Keep your pets in a crate, bedroom, or gated area if you live in a neighborhood with lots of Trick-or- Treaters, or if you are having a party where the door will be opening and closing often throughout the night. Animals that escape on Halloween night are hard to find. 3. Know your pet and anticipate their unique needs and behaviors. If your pet is typically anxious and nervous, he may need extra support on Halloween in the form of products designed to relieve anxiety such as Adaptil, Nutra-calm, Feliway, and Thundershirts. These items can be found in the retail boutique at our clinic. If your dog gets along with everyone EXCEPT people wearing hats, carrying umbrellas, or skating on roller blades you probably should keep him home on Halloween night. If you do take your dog Trick-or-Treating with your family, expect that your dog will see all sorts of strange things and prepare. If your pet is spooked by loud noises such as doorbells and screaming children, he is better off staying at home in a secluded place that is as quiet as possible. 1. Put a costume on your pet unless it is safe, comfortable, and well tolerated. 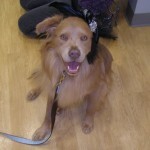 Costumes should not be tight around the neck or have dangley parts that could entangle your pet or trap them somewhere. 2. Leave your pet unsupervised while wearing a costume. Dogs in particular may ingest parts of their costume and run the risk of having a foreign body. 3. Give your pets candy of any kind. Candy is full of hazardous potential for dogs and cats. The most common toxins in candy are : Chocolate, Xylitol, Raisins, Macadamia Nuts, and Wrappers. CALL POISON CONTROL at 888-426-4435 and get a case number to give to Dr. Blake when you come in for treatment if that is recommended by poison control. CALL OCEANSIDE ANIMAL HOSPITAL at 508-744-3838 and let us know what toxin your pet has ingested and where you are driving from to give us an estimated time of arrival. We will tell you to come down to the clinic immediately! If your pet ingested a toxin after our normal business hours CALL CAPE COD VETERINARY SPECIALISTS in Buzzards Bay at 508-759-5125 or in Dennis at 508-398-7575. Finally, if you DO dress your pet in costume, DO post their picture to our Facebook Page and we will enter you to win a $50 gift certificate to our retail BOOtique! Have a Spooktacularly Safe Hallowen!